Hire the best brass bands for weddings with us here at Entertainment Nation! From traditional ensembles, to swing and jazz arrangements, to modern brass bands for weddings, we have everything you need to guarantee an unforgettable wedding day. We've made sure we only work with the most professional, talented, and reliable brass bands, guaranteeing you a top performance on your special day. 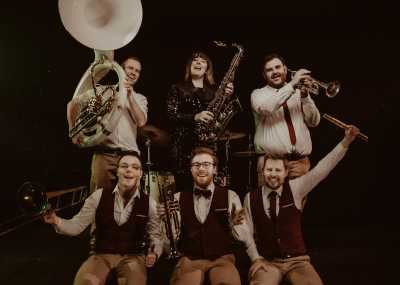 Nothing rivals the glamour and sparkle of a full-blown brass band, with gleaming horns, elegant woodwind and exciting drums not only sounding great but looking the part too! Brass bands are popular all over the world, and nothing beats the versatility of a full band who can offer a vibrant and rich sound at your venue. Great for contemporary weddings and traditional settings alike, our wedding brass bands for hire deliver up-beat music everyone will love. Dive into our enormous selection of talented wedding brass bands, and you're sure to find a band you love. If you have any questions, get in touch with our friendly team of advisers - we're experts in organising wedding entertainment, and we're available from 10am to 10pm every day to help you find the band of your dreams. Why Hire a Wedding Brass Band? All our live bands add an unparalleled level of excitement to any wedding celebrations, but there's something especially stirring about a brass band. Brass bands deliver their stunning music through hands and breath, making it feel so much more human and emotional, exactly what you need when you take to the floor for your exhilarating first dance. Not many groups incite such heart-stirring responses as brass bands - and with their modern-day versatility, they can provide romantic classical music or cover exciting contemporary songs, making them an excellent choice for your big day. Full brass bands normally have line ups of at least 5-8 members, so you can expect the base price to start from around £1500 - £2000. Depending on extra musicians, requests, distance to travel and accommodation costs, this number can rise significantly, so make sure you do plenty of research so that you can remain within your budget. Our advisers are here to make sure we find you a band that matches your requirements. All our acts are strictly vetted by industry professionals, so no matter who you choose to play at your venue, you're guaranteed an incredible show from experienced and reliable performers. 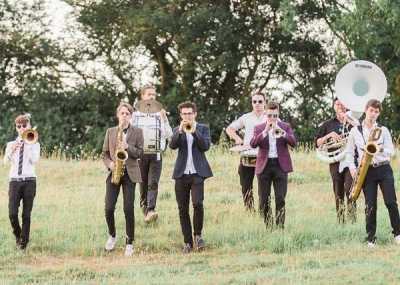 What Songs Will I Hear with Wedding Brass Band Hire? Since the revival of brass bands for the modern day, all manner of songs have been re-imagined through brass instruments. 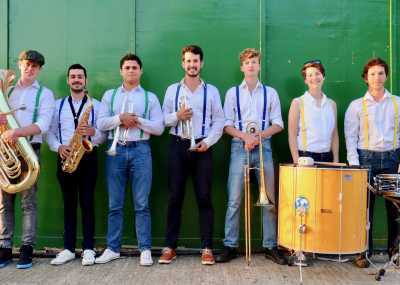 Groups like the Hackney Colliery Band, the Youngblood Brass Band, and the grammy-nominated Hot 8 Brass Band have all proven you can attract crowds of mesmerised dancers with the traditional sounds of brass - which is what our bands will do! Whether you want timeless classics or modern songs, our brass bands for weddings have incredibly varied repertoires. They allow you to create romantic set lists for the ceremony, and blisteringly hot covers to get the party going long into the night! Our brass bands can offer songs for all ages and may consult you to make sure their set list is suited to your audience's tastes. 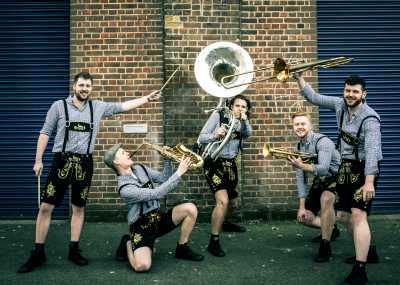 What's Included with a Wedding Brass Band for Hire? The only way to be certain of what you'll receive when you find a wedding brass band to hire is to read their profile carefully! Every band's offering varies slightly. 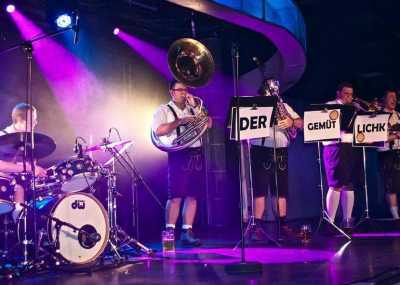 Brass bands may play acoustically, or they may have individual PA systems to amplify the sounds, so this is something you need to check before you book - your band may have to work with sound limiters at your venue. Check if your chosen band supplies their own lighting, and if recorded music will be played when they aren't performing - it can make all the difference! Be sure, too, to check out all the optional extras on the band's profile - from manned DJ services to additional requests, musicians, and singers, you can often tailor your band to your heart's desire! We're here to make it easy when finding wedding brass bands to hire! Our quick enquiry form makes it a doddle to get a comprehensive quote for your chosen band. Simply fill in your details, hit the button, and our team will be back to you as soon as we can. You're given the security of booking through a reputable UK agency - our secure online payment methods and comprehensive contracts mean you have total confidence in your booking.